Samsung always believes in competition and that is the reason it introduces a competitive range of headphones. Samsung Level On Pro headphone is a good sounding headphone by Samsung. The performance of the headphone is on par with other models but not that great. It’s actually quite decent for Bluetooth and connectivity it offers. Still, it lacks full functionality that is offered by most Samsung headphones. The active noise cancellation feature of the headphone is amazing. And, this is where it scores the highest. It’s perfect for music lovers, being wireless and handy. It’s also light in weight and that is an added advantage of the headphone. The headphone integrates with Samsung level up application. This app provides added features like text to speech and volume manager. Samsung Level On pro has a touch control and sound share. With one touch of a button, you can shuttle between your music with ease. It lets you enjoy hours of music without any discomfort. The overall style of the headphone is also good if you compare it with other headphones in this league. It is designed with premium material and the build of the headphone is also good. The performance of the headphone is good especially the sound in the mid-range. Samsung Level On Pro gives you high-end performance once you integrate it with your various devices. And, if you are an app person, then this headphone is surely for you as there is a special Samsung level app you can integrate this headphone with. The sound is clear so it’s also great for all the music lovers out there. In fact, with its wireless connectivity, you can actually enjoy music on the go. The build is strong if you compare it with the previous models of Samsung and that makes this headphone worth a buy. It’s also good if you are a frequent traveler. The active noise-canceling feature of the headphone is not only amazing but also efficient. It completely blocks all the sounds around to give you a pure music experience. With the active noise-canceling feature, you will get to hear richer and clearer audio. It’s also good if you want to completely unwind. The headphone has a smart touch so you can also enjoy its touch features at ease. It will also work well for your gaming needs. Though the sounds are not exceptional, still you can enjoy gaming and movie experience with Samsung Level On Pro without any problem. There are many great features of Samsung Level On Pro, let us look at some of the key features. The headphone has ultra high-quality audio (UHQA) technology that delivers a true 24-bit digital audio experience with up to 2x wider and better frequency range than normal CD-quality wireless sound. The headphone has an active noise cancellation feature and it’s amazing. It lets the listeners experience brilliant and recital hall sound. The headphone features UHQA and that is compatible with select Samsung Galaxy devices and all the other devices you want to pair with. Samsung Level On Pro has stylish command touch controls that keep the music and phone controls simple. It offers intuitive quality and its indeed good in sound. It features Talk-In Mode that allows you to turn the ambient noise off or on while listening to audio. You can adjust to all the sounds even while you are traveling. Experience soundproof technology like never before with the headphone. The headphone has sound share technology that allows you to share your personal streaming audio with the second level on wireless PRO. This is actually rear in a headphone if you compare it with other models. The headphone is designed with super premium materials and finish and that enhances the overall look of the headphone. In fact, you can flaunt it in style wherever you go. The headphone is available in the foldable frame and that makes it easy to carry along. Samsung Level On Pro headphone can be easily integrated with Samsung level up app. It provides added features such as sound alive (Sound Effect), and Text-To-Speech when connected with Samsung Bluetooth headphones. It also gives easy access to the volume monitor feature. You can also use sound live feature along with the headphone. This makes the headphone popular too compared to other high-end models. The headphone is available with a 3.5mm audio cable with a separate USB charging cable. The headphone comes with a unique carrying pouch. The batteries can be replaced and recharged accordingly. The battery standby time is up to 10 hours. It features 3.5mm wired or Bluetooth wireless connectivity. If you compare Samsung Level On Pro headphone with other headphones that are available in this range, then this might not be too comfortable. The size of the headphone is too bulky and big. For an on-ear headphone, it can be large for the ears. Though the pads are comfortable still, you might feel some kind of pressure on your ears at times. If you wear specs, then you might feel uncomfortable wearing this headphone. As it’s quite wide, it can pose a problem. However, it may fit well if your head size is big. So, comfort depends on your head size. Samsung Level On Pro headphone has an active noise cancellation feature and that makes this headphone popular and well liked. The feature is good as it blocks the surrounding noises giving you a great audio quality. The feature lets you hear vivid and concert hall sound. You can also use the feature while traveling. The soundproof feature is great if you want to enjoy music on the go. The feature is good for low frequency and mid range sounds. But, it may not work so well with higher frequency sounds. This also depends on the place or your preference. Samsung Level On Pro headphone is designed with premium materials and has an amazing finish. It is indeed a stylish headphone and you can flaunt it wherever you go. The quality of the headphone is also good and the build is sturdy. Even if you drop the headphone, there won’t be an issue or problem with the sound quality of the headphone. The headphone can be folded and you can carry it along with you easily. If you compare it with other headphones, then this is much bigger in size. But, the ear cushions are soft and comfortable. There is no clamping even if you wear the headphone for hours. Samsung Level On Pro headphone has a smooth and natural sound quality. The bass base is hunky but there is no such distortion in the sound of the headphone. The headphone provides an accessible tone and that makes it quite popular in its league. The low-frequency sound of the headphone is good if you compare it with mid-frequency base. Though, it can crack a bit on the higher frequency range. But, this depends on the type of music genre. The headphone has Ultra High-Quality Audio (UHQA) technology that delivers a true 24-bit digital audio experience. You will not be disappointed with the sound quality of the headphone for sure. The battery performance of the headphone is also good with up to 10 hours of standby battery. Once you charge the battery, you can enjoy continuous music. It’s actually good if you need the headphone while traveling. You don’t have to worry about charging it time and again. The headphone comes with USB charging cable and that makes charging simple. Samsung Level On Pro headphone offers 200 hours of standby time and that is also a good feature of the headphone. The overall battery performance is surely good but not that great. It could have been better for the price. The sound is refined and good. It offers high-quality wireless streaming. The headphone can have a flat presentation. It has no definite channel. Can be loose in fit. There can be a problem with integration. 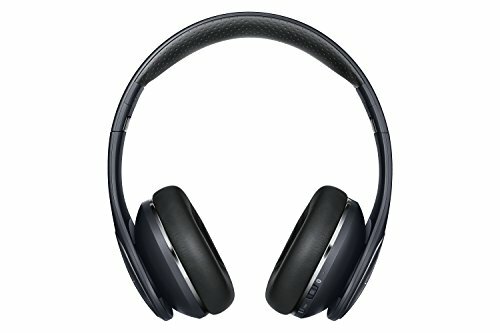 Samsung Level On Pro headphone has a smooth performance with wireless features it offers. The sound of the headphone is refined and there is no distortion as such. The best part about the headphone is the noise-canceling feature that gives you a total soundproof music experience. You can hear the audio loud and clear with this feature. The battery life of the headphone stands out if you compare it with other models in this price. The battery performance of the headphone is good and you can enjoy hours of music at a stretch. The build though sturdy has a plastic body. It’s stylish but it can suffer because of this reason. The headphone offers wireless streaming like no other headphone. It can be integrated with the Samsung app to give you a great music experience. You can also control the options with the help of the application. Overall, it is a good buy for the price.